Get your measuring cups and stand mixer ready and stock up on butter: It’s cookie week at Cook In / Dine Out! 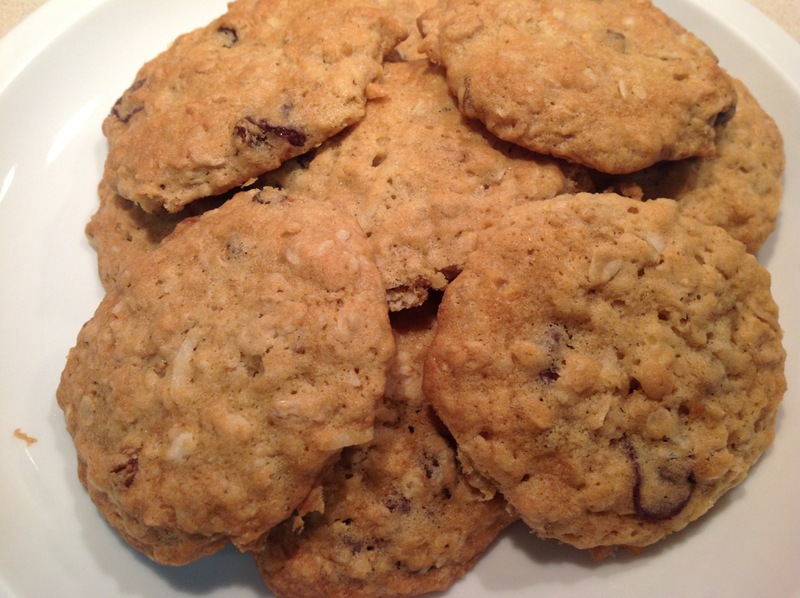 I Am a Food Blog, where I found the recipe, acknowledges that they are basically an oatmeal cookie with your choice of add-ins thrown in, creating the opportunity for creative variation in both the recipe and the name. Nuts (pecans, walnuts or almonds) would be good in these, as would white chocolate or dried cranberries instead of raisins. I bet you could even make an argument for bacon bits. 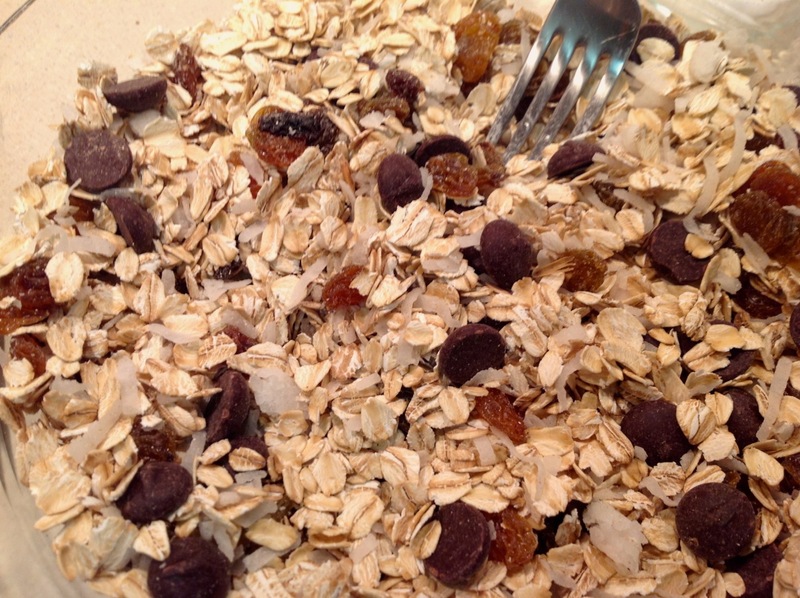 I went with the blog’s combination of dark chocolate, raisins and coconut. Although there is less sugar in these than would typically go in a standard cookie recipe, the reduced sweetness is offset by the combination of flavors of the add-ins. A note about I Am a Food Blog: it’s a really cool site with a beautiful design; however, the Ranger Cookies were its writer Stephanie Le’s most recent post and they went up 3 months ago, so it appears she may have suspended the blog. She also had a prior cooking blog, Momofuku for 2, where she cooked her way through the Momofuku cookbook. I tried to contact her about it through her blog’s contact function, but the message didn’t go through. Let’s hope she resurfaces again soon. 2. Beat the butter and sugars together with a stand or hand mixer on medium-high speed until light and fluffy. Add the eggs and mix well. Beat in the vanilla. In a separate bowl, whisk together the flour, baking soda and salt. Add to the butter mixture and beat on low speed until just incorporated. 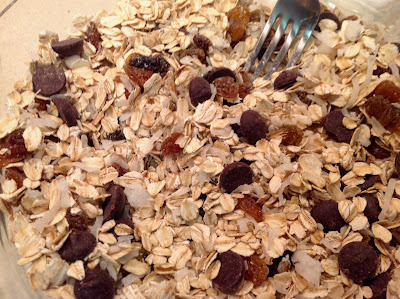 Add the rolled oats, coconut, chocolate chips and raisins and use a spoon to stir until combined. 3. Form the dough into balls measuring about 1 ½ inches across. Place on a parchment-lined baking sheet (you’ll use two) about 2-3 inches apart. Bake for 14 to 16 minutes, rotating baking sheets top-to-bottom and front-to-back after the first 7-8 minutes, until golden brown and just set in the center. 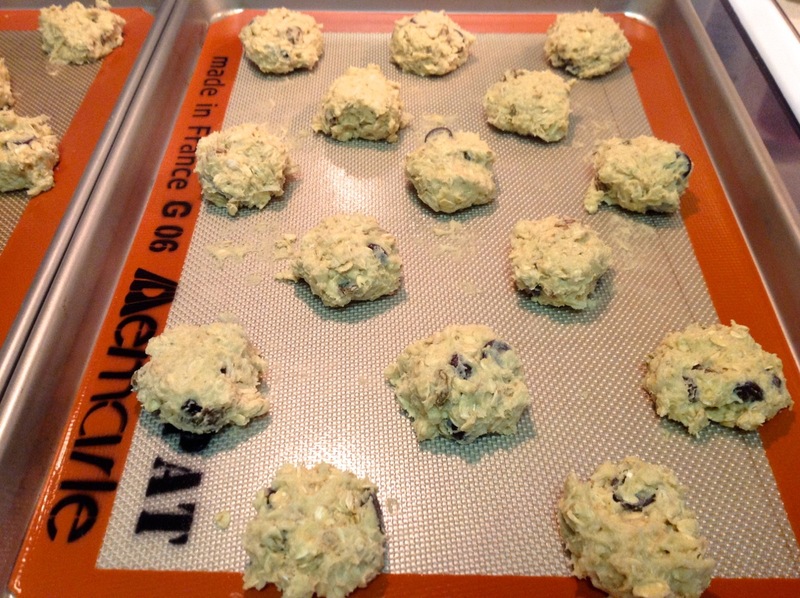 Allow cookies to cool a bit on the baking sheets and then transfer to a wire rack to cool completely. These were quite good, but I hereby request you make Ranger cookies with bacon bits. Let's try it next year!